Orange is a high-energy, fun and friendly color, so it's perfect for the room where we break bread with family and friends. Orange oozes confidence. 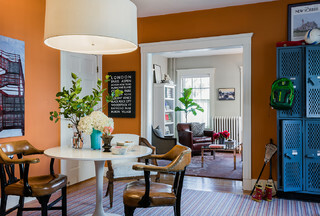 But for those who lack the confidence to test this outgoing hue in their own spaces, I've gathered together 10 tasty orange dining rooms to inspire you, along with tips on how to successfully incorporate this fun-loving color. Orange can quickly turn pastel if you opt for a lighter shade. 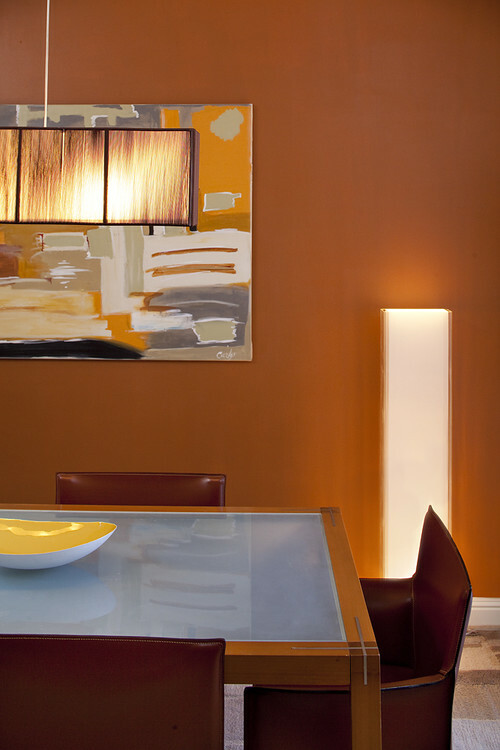 To get a more sophisticated-looking (and dining room–worthy) light orange, pick a hue that has some brown in it, such as the first and third paint colors shown here. 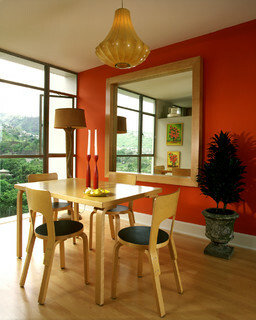 The easiest way to bring bold orange into your dining room is to pick a hue you like and paint a wall or two. Having trouble selecting the right orange? Pull a shade out of a favorite painting or upholstery fabric. It's likely a color you are drawn to, and it will coordinate well with the decorative item that inspired it. Modern Dining Room by Dallas General Contractors Scudder Construction LLC. A red-orange like this one is not for the timid. Make it work by keeping the other colors in the room light and neutral. 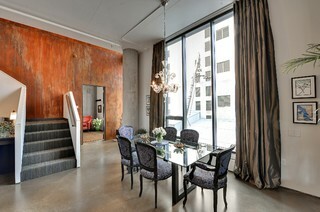 I'd also recommend limiting the number of attention-getting accessories; otherwise the space can become overwhelming. Can't decide on or afford artwork you like? Create your own work of art via painted stripes or other geometric shapes using a bold color palette. The shades of orange and gray used here are a superb choice, as they pick up on the orange and gray hues used elsewhere in the room. This intense red-orange wall color works well here because it's adjacent to the window wall. All that bright natural light streaming in balances out the deep, bold hue. Keep in mind that a large window can become a dark abyss at night, depending on the view beyond the glass. A white or other light-colored window shade can help lighten up the room at night. 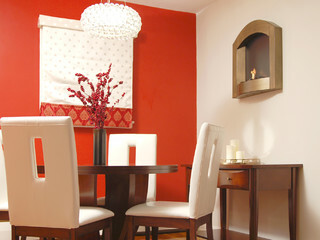 Bold, bright red-orange looks modern and elegant paired with crisp white and dark brown. This room exemplifies my favorite color advice: selecting neutral hues for items you want to keep for a long time, but going for bold color on things that are easy and relatively cheap to change, such as an accent wall color. Perhaps because it reminds me of Thanksgiving feasts, there's just something so delectable about pumpkin-colored walls in the dining room. 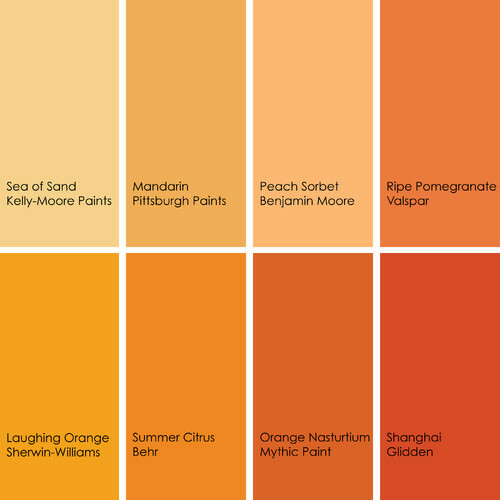 Think about your favorite orange food — ice-cold cantaloupe, rich butternut squash soup or a glass of refreshing freshly squeezed orange juice — for color palette inspiration. For fans of bold, yummy color, it's an easy way to find a sweet hue. Of course, not everyone wants to be cocooned in a bold-colored room. But you can certainly mix in some fun, bright color and still have a light and airy space. 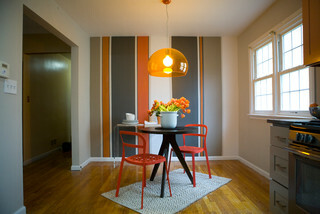 I love the small bits of happy orange these hip chairs add to the backdrop of cool gray. 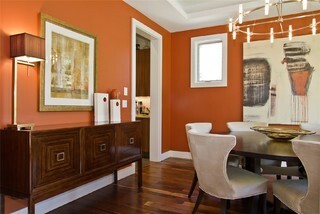 More cool orange dining chairs, this time in a dining room washed in warm neutrals. The warmth of the palette makes this a cozy and inviting space for a dinner party on even the coldest of Denver evenings. Here's a slightly softer orange hue that still packs a nice punch, due to its richness. If you have interesting artwork or decorative accessories to display, it's a good idea to limit the color palette or pick more toned-down hues. They'll complement (rather than compete with) the accessories. 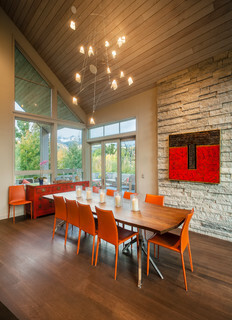 A rust activator added to iron paint achieved the orange, patinated finish on this dining room accent wall. It's a brilliant, unique way to inject interesting color and texture.